Welcome, and thank you for visiting our website. We are having technical issues with mobile use please use landscape if you are using a phone. The Bowmen (and women!) of Minchinhampton are a small and friendly target archery club who are based in Eastington at the Community Centre ground. The club has been in existence for over 35 years and is still going strong. Our members participate primarily in local and regional tournaments, and we organise an annual tournament which attracts competitors from many other clubs. Although several of our members shoot at county level, our aim as a club is also to promote archery in the local area and beyond. 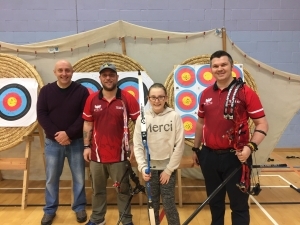 Consequently, we run at least one beginner’s course each year, sometimes two, along with several “Have a Go” events at which people who have never tried archery before can experience it for themselves under skilled supervision. Please explore this website for more information on the Bowmen of Minchinhampton. Recent visit from Matt Neeve ( Invicta Game, Team Gold Medalist ) his daughter and Johnny.